Just north of Rockford, in Algoma township, there is a place called Hell's Bridge. It is located along Friske Rd. Over the past few years, it has become notorious for being haunted. I run a paranormal group with a friend, and the two of us had our first outing there about a year ago. We've had a total of four investigations there. We've caught a lot of EVPs on our digital recorders (several being children's voices). The last time we went, it was just the two of us again. We decided to split up. I went to the far side of the bridge, and she took the near side. On my side, things were not terribly active. My camcorder's battery did get drained. It had been full at 156 minutes, recently charged. The second I took it out, it drained. I caught several EVPs, but they were nothing compared to what my friend caught. She heard something splash in the water and caught a high-pitched scream and a man saying ''yo'' on her voice recorders. 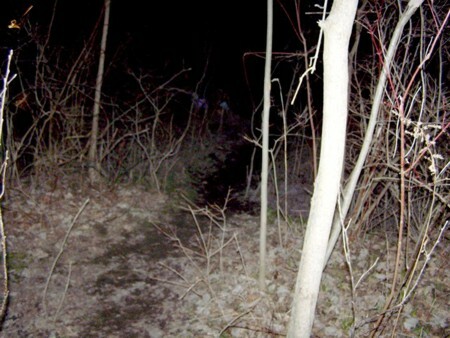 Also, she took several pictures in which there is a thick black mass hovering over the ground, and it moved. We tried to recreate these pictures but could not. The picture uploaded here is the most convincing piece of evidence we've gathered to date. It has been in no way photoshopped. This is how it originally appeared on her camera. At first, she thought they were just two blue misty things, but, upon zooming in, I told her that I saw two very distinct figures. I doubt anyone was hung from the little metal bridge on the trail. It is over Cedar Creek not the Rogue River. The story is that the people were hung on a bridge over the Rogue River. That bridge may not be there anymore. The Cedar Creek bridge on the trail is only a couple of feet above the small creek.